Made another trip around the sun? Then it is time to celebrate under the sun aboard on of our classic sailboats. Grab your friends and family to celebrate the big 3-O, 4-O, 5-O, or even the 1 double-O! 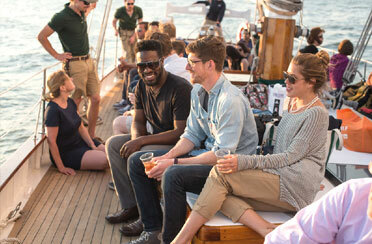 All ages are welcome aboard our classic yachts for a celebration to last the ages. Look no further because you have found the best Newport Birthday party venue in town! Sail with us in Narragansett Bay and watch the sun set behind Newport. Sip on champagne and enjoy one of these classic boats for your special day. This is a Newport birthday party venue that is both fun and elegant. Is both adventurous and graceful. Reflect with friends and family on your past year and make goals for your future to come. Cruise with us in style and comfort and book your birthday party venue now! The Schooner Adirondack II is certified for up to 57 guests while the Sloop Eleanor is certified up to 24 guests. Catering and bar are available for both.